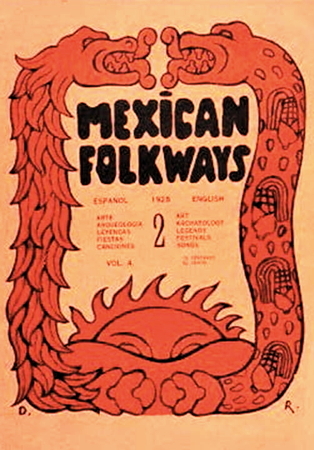 Mexican Folkways, a magazine about Mexico. 1925-1937 (G398.305 M574 BEN). Edited by Toor, Frances. "This Mexican magazine has exceptionally fine articles on folklore of the Aztecs. The Spanish is translated into English. Well illustrated. Sometimes includes music." Shambaugh, Mary Effie, Folk Festivals. Boggs, Ralph Steele. Una bibliografia completa. Mexico, D.F., 1945. (INDEX MISSING) [OCLC 1726485]. Gamio, Manuel. "The utilitarian aspect of folklore," in Mexican Folkways, 1:1 (1925), p. 6-8. (G398.305 M574 BEN). Saenz, Moises. "Nuestras escuelas rurales," in Mexican Folkways, 3:1 (1927), p. 44-52. (G398.305 M574 BEN).